The following is a great first-hand review of the new Brooks Cambium saddle from our senior mechanic Tim Weeks. But before you run out and try one for yourself, remember that butts come in all shapes and sizes and not every bicycle saddle will agree with everyone’s rear end. If you wish to find out more about choosing an appropriate saddle for your posterior and style of riding, check out this previous saddle review, or better yet, come by our shop and we’ll talk you through it. Enjoy! I have been riding and commuting on the Brooks Cambium narrow saddle for a few months and I finally have the time to give it a good review. Being a person of the narrow sit bone persuasion, I often have trouble finding good, high-quality saddles that are comfortable and durable. Quite a few of the saddles that I used in the past always seemed to have a few things going for them but then lacked that one important quality to make the saddle just right. I could choose from two of three of these qualities, but not all three. These three qualities in my mind are: 1) Sit bone comfort, 2) Inner thigh chafe, and 3) Numbness factor. 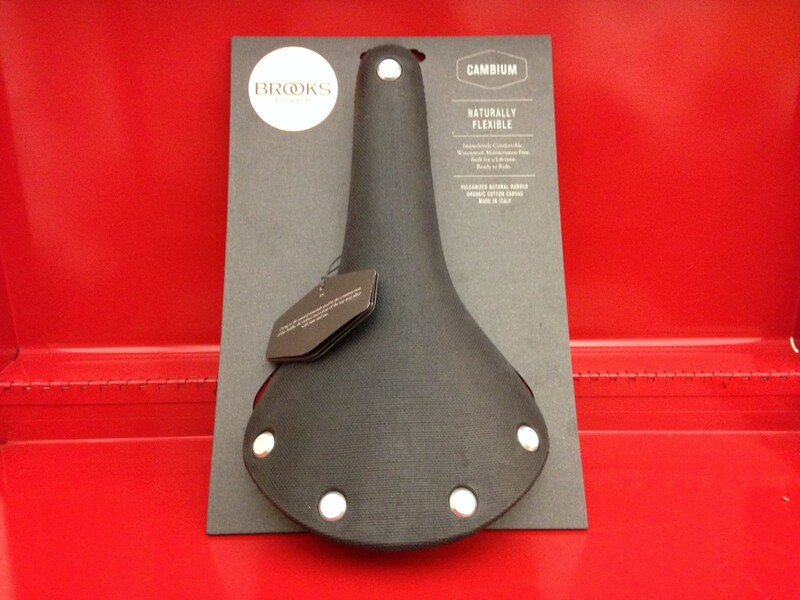 For me, the narrow model Cambium saddle holds up well to the first category of width. Having taken it out on some longer rides wearing different clothing and in various weather conditions, Brooks designed this aspect of fit well. I don’t find myself scooting around on the saddle to try and find the “comfort zone”. Even with a longer ride, while wearing cotton undies and jean shorts in warmer weather, I still didn’t have the usual sit bone discomfort. The second category of thigh chafe also rated good, in my experience. I didn’t experience any chafing at all. I don’t know if this is because of the narrow lip of rubber on the lower side of the saddle that is more prone to slipping on fabric and preventing bunching, or if the nose of the saddle is just the right width for my needs. I have noticed that saddles with bulky padded noses, particularly leather saddles with deeper side profiles, tend to cause me a lot of thigh chafe. With the Cambium, this did not happen. Now, the third and last category of “numbness factor.” I’m sure many a cyclist is all too familiar with this, wherein one is out on a ride and the first few miles are fine, but after a little while there is a buzzing that eventually turns into numbness. Before you know it, you’re out of the saddle and wiggling your hips like you have a bee in your pants, trying desperately to get some blood moving back to the affected areas. I fully prepared for this on my first long ride, figuring that it was just a fact of life considering that the Cambium performed well in the other two categories. As I hit mile five on this longer ride with few stops, things were going well as usual. I figured that I’d start to feel a buzzing in the next mile or two. While reaching mile ten, I was surprised that I was still comfortably unaffected. Surely this couldn’t last, I thought, but I was wrong. Around three fourths of the way through the ride, I was still quite comfortable. When I finished the ride–this whole time no use of chamois shorts had been employed–I was quite happy. The New Brooks Cambium saddle finally fulfilled all three categories of my saddle needs. This saddle also enjoys a few other features that are worth mentioning. First, it’s waterproof. Second, it’s vegan! No animals were harmed in the making of this saddle. Lastly, it comes with the great Brooks warranty. I give this saddle a whopping nine point five out of ten stars (because nothing is ever perfect).